The Atmospheric Research Radio-Acoustic Sensor System (RASS) is a state-of-the-art design which operates on the principle of finding the acoustic frequency at which the Bragg reinforcement occurs at each height, as opposed to the cw RF, Doppler method, (which compromises temperature resolution), and the pulsed RF Doppler method, (which incurs higher costs and compromises height resolution). The Bragg-Reinforcement-Search technique (BRS) offers good height resolution with superb virtual temperature accuracy. The temporal resolution of 10-15 minutes is more than sufficient for short term stable atmospheric work. The ARPL RASS is a compact unit, decreasing the low temperature bias at low heights that can occur with other RASS systems. The ARPL RASS experiences a bias to low temperatures of not more than 0.2 degrees at 50m, and nill at 100m. The RF operating frequency of 1270 MHz has been chosen to be the most suitable for operation and licencing in compliance with WRC requirements. The Atmospheric Research RASS uses active nulling of coupling between the transmit and receive antennae, to minimise coupling and maximising the signal to noise performance of the instrument. Why Use an Atmospheric Research RASS? ARPL use state of the art techniques and alogorithms in the RASS design, developed in conjunction with researchers from the Australian Defence Force Academy. The ARPL RASS is engineered for Australian conditions, to give long term reliability in harsh conditions. The ARPL RASS is engineered for compatibility with Australian Communications Authority spectrum allocation and licencing requirements. ARPL is an Australian company, so after-sales service, upgrades and consultation are readily available. 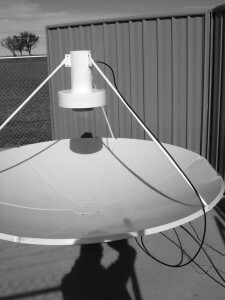 L-band RF feed for RASS antenna. A ground sensor suite (temperature, relative humidity, atmospheric pressure) to provide the virtual temperature at the ground. A complete ground-level meteorological sensor suite (temperature, relative humidity, atmospheric pressure, wind velocity and direction), with data logging by the RASS computer. Integration of the RASS and a SODAR. The baseline RASS is not supplied as an add-on to a SODAR. This is not recommended and gives a performance compromise. If the customer needs a combined RASS/SODAR, however, a combined unit can be delivered. ARPL can provide tailoring of software to user requirements. Such software modifications are undertaken on a firm fixed price basis, to an agreed specification, unless otherwise agreed. 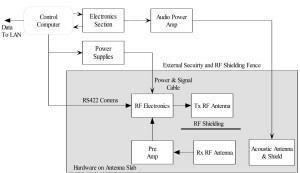 ARPL can design and install client-specific communications interfaces from the RASS control computer output port. Data Interface Serial Interface, RS232, at computer. Other interface and transmission options can be supported, please request options and prices. Data Format Virtual* temperature versus height, with Data Quality parameter. Potential virtual temperature versus height available as an option. Sample files can be supplied on request. Data Frequency Samples on approximately 2 minute basis, with running average on 10-15 minutes. Timing varies with temperature variation with height of the atmosphere at the time.